During E3 2018, I was able to try out Compulsion Games’ latest demo build of We Happy Few, which I had previously tried out at E3 2016. You can read my impressions of this 2018 demo here, but suffice to say that I loved it and that I am excited for the final game release on August 10, 2018. Also just like at E3 2016, I spent some time talking with Sam Abbott, the Chief Operating Officer and Producer for We Happy Few. 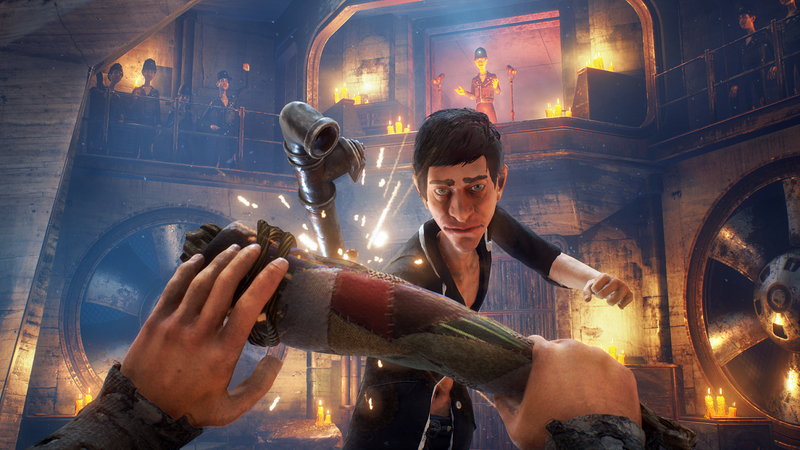 During our interview together, we talked about the changes to the game that has occurred since the game first debuted, making We Happy Few a multiplatform experience, and more. You can find out more about We Happy Few on their Website, like them on Facebook, tweet at them on Twitter, subscribe to them on YouTube, post on their official forums, and join the official subreddit. You can pre-order We Happy Few now for Xbox One (Regular and Deluxe Editions) and PlayStation 4 (Regular and Deluxe Editions). We Happy Few is scheduled for release on August 10, 2018. Sam Abbott: I am Sam Abbot, and I am the Chief Operating Officer and Producer for We Happy Few. OR: Last time we talked was after E3 2016 when We Happy Few had just debuted after the Microsoft Press Conference. What has it been like since then? 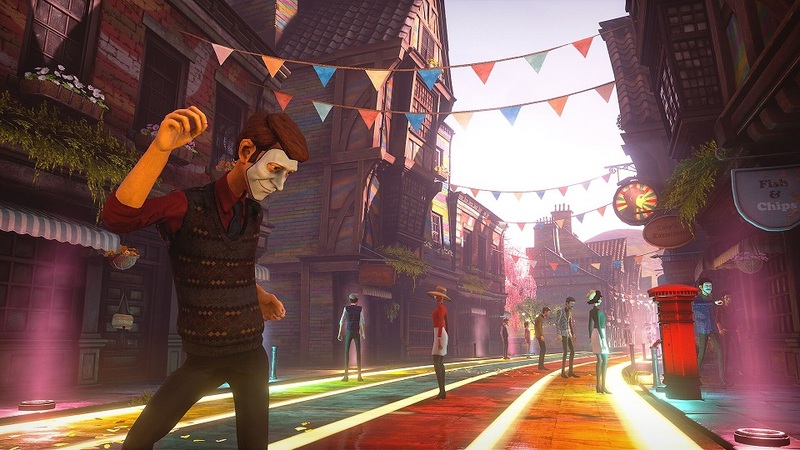 SA: The last two years has been basically us working with the community to improve [We Happy Few] and understand how they were playing with the gameplay mechanics inside the sandbox of We Happy Few. And in the background, we were working on the single-player narrative, which is coming out in a couple of months. OR: What big changes has occurred in [We Happy Few] since ? SA: Everything. Everything has changed. There is very little we haven’t touched since that time. Big changes include, obviously, [bringing] out the story of our three characters. None of that was in the Early Access version. That’s about a twenty-hour campaign. It’s a huge amount of story that we’re really excited for people to play. But a lot of things have changed in the gameplay. We’ve revamped combat a couple of times. We’ve built an entirely new stealth system. We have reworked our conformity systems to be clearer and easier to explain to players. We have rebuilt the HUD, we have rebuilt all of the visual effects, we have built and gone over and improved all of our art. We have improved the procedural systems- so we, gosh, have so many changes there [that] its hard to believe. We changed the survival system completely. So we tried a few different experiences with that. But, basically, [what] we have now is that instead of just ticking down and dying, we have really just a buff and debuff system. So if you’re hungry, you’re not as good in combat. If you eat, you’re just better in combat for a little time. Most of the time, though, you operate as normal. You can buff yourself whenever you want. You can also turn these ‘needs’ off, in which case we remove the debuffs. That’s just really for people who just don’t like survival at all. In which case, you can throw all the food on the ground if you want. It really is not a problem. It’s very hard to explain fundamental overhaul of the game. It’s probably three to four times bigger than it was on Early Access launch in terms of content, probably more. It’s certainly three times more than the last Early Access version. So its significant. I don’t want to claim it’s Skyrim or something like that, its not, but its certainly a lot of game for people to play. There are three characters that We Happy Few tells the story of- here, we see Arthur Hastings clutching a pipe in this character showcase art. (Image owned by Compulsion Games). OR: You mentioned a procedurally generated world. How [has] that evolved since Early Access? SA: Mostly in terms of functionality and adding things that we think are interesting. For example, out in the garden of the District, you now have a field that’s much less like a town and more like a countryside. You have big rock formations, you have foliage systems. We’ve done a lot of work on performance – for example, the grass in the game sort of winds around you, but we don’t generate it to save on load times. So a lot of stuff under the hood. One of the ways that we’ve built out and refined all of the roads and the feeling added a little bit of curvature to the world- [its] height variation. And [in] the village procedural areas, we have sort of closed back in the village again. So it’s a very claustrophobic, very scary environment, because, if you put one step out of line, you’re probably in big trouble. But we’ve also added a lot of hiding spots in places to evade enemies. So the danger is omnipresent, but you’ve also got a lot of tools to deal with that. OR: What has surprised you about developing [We Happy Few] over the past few years? SA: There’s very little that didn’t surprise me, I’d say. I think the biggest surprise really is the enthusiasm from everybody that came into contact with it. It’s been a game where almost everyone has said that ‘This is a project that really matters to me.’ And that’s, I think, because of the heart and love that everybody that has worked on it or worked with us on it has really poured into it. You look at the room and walls around us here, this is different and interesting. And everything in the game is like that too. And so how it infects people with enthusiasm, that is pretty surprising. OR: When you we last talked, you discussed how Brazil and Hot Fuzz were a couple of your influences with [We Happy Few]. Has anything else come to influence you since that time? SA: No, the influences really remain the same. In fact, the game’s themes and inspirations have been remarkably consistent over the past four years. We did change a few mechanics, so we have a few more game-inspirations. For example, combat, we moved away from a much more punishing, slower combat style like Dark Souls to something a bit more engaging and frantic. The Bobbies are still prevalent in We Happy Few in this ‘drugged out’ alternative version of 1964’s post-war Great Britain. (Image owned by Compulsion Games). OR: How did that affect the story- because I remember playing it originally as a survival where you were constantly foraging [for food to not die]- to something that is more of a debuff system? SA: So the story is in fact why we changed that system. The problem was that you were going through the game, you were excited about moving to the next part of the story, but you got interrupted because ‘well, I got to go get food because I’m going to die otherwise.’ Now you don’t have to do that. You’ll be gimped for awhile, but if you find some food or water along the way, you’ll be fine. You don’t have to worry about dying anymore. The thing is though that if you’re debuffed along all of your statuses, you’ll probably struggle in combat. So there’s an incentive there, but it is optional. If you wanted to, you could ignore it. And so the story itself has just basically been- we scaled up from fifteen to forty people, so quality of the story that we’re telling is much greater than we had anticipated originally. OR: Do you know how far to take the story and then stop? SA: I think we know we’ve got team members feeling a little uncomfortable about something. For example, we have a scene where somebody’s basically kidnapping someone. We felt like they’re trying to do it for good reasons, but the animation was quite rough. We weren’t comfortable with that, because we felt that it was in conflict with the character- he didn’t want to be doing what he was doing, but he has to do it. So we changed the animations so it was gentler when he was putting the person down. It’s the little things like that. Typically speaking, we try to make things that are interesting. We don’t really try to ‘shock’ people. We’re not here to court controversy, we’re really here to just try to engage and interest. OR: Is Joy still a drug that makes you ‘forget’? In fact, we have built out the Joy mechanics themselves as well. So we’ve changed them. So, yeah, you take Joy and you go through an addiction and withdrawal cycle. But ultimately, as you take more and more of it, your memory starts to suffer. And what happens with that, [is] that basically because your character is all about remembering things, when he starts to get to the point where he can’t remember what is happening anymore, he starts acting out – he causes a lot of suspicion around him. He cannot do normal things, so you’re in a very vulnerable state while he weans himself off of it. Now obviously, its still a video game, so its representative- but we [are] quite happy with how its working. While Joy does make the world an absolutely colorful and happy place, it also makes you forget…which is a horrific thing in a game that is about remembering the past. (Image courtesy of Compulsion Games). OR: One of the tag lines for [We Happy Few] originally was “Happiness is a Choice.” Is [Happiness] still that in this game? SA: Yes, absolutely. All of that stuff that you saw in the Prologue, and all of those themes and messages are still the same. It’s just the story is finally here. OR: How far away are we from a final product? SA: We are launching August 10th. SA: PC, Xbox One, and PlayStation 4. OR: Originally, this game was an Xbox Exclusive. What thoughts went into developing [We Happy Few] as a multiplatform title? SA: Basically, that was pretty simply- when we were looking at reinvesting and changing and really building out the game to be something much bigger than what it was, all of those discussions [we] felt didn’t really make a lot of sense anymore. And Microsoft agreed. They’ve been excellent partners about all of that. Arthur, as seen in this photograph, defends himself from attack with a weapon. The survival aspect from E3 2016 has been dialed back into a debuff system instead. (Image owned by Compulsion Games). OR: So what lies next after We Happy Few? SA: Well, once we finally finish work on the game, we’ll probably start working on some cool new stories in the We Happy Few universe for DLC. So we have three pieces of DLC that we’ve been thinking about in the background, and we’re going to start building them. And they’re going to be quite different and hopefully quite fun in the same, crazy, wacky world. 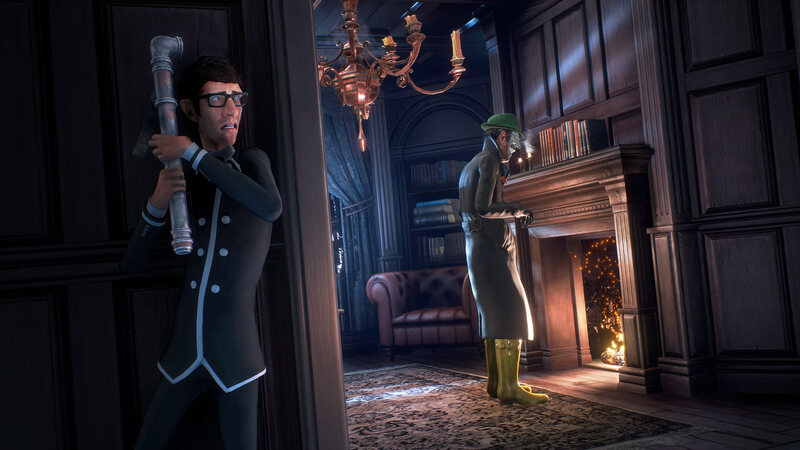 OR: Last question: Someone who may have not been keeping up with We Happy Few since E3 2016, but is becoming interested [in it] again as we near launch, what do you have to say to them? SA: I think I’m going to parrot something that [a co-worker] said to me earlier today: “I think this is the game that people have been waiting for.” We have been putting a lot of love and heart into it, and hopefully we’ll impress you guys at launch. Are you excited about the changes that have come to We Happy Few since it was first revealed at E3 2016? 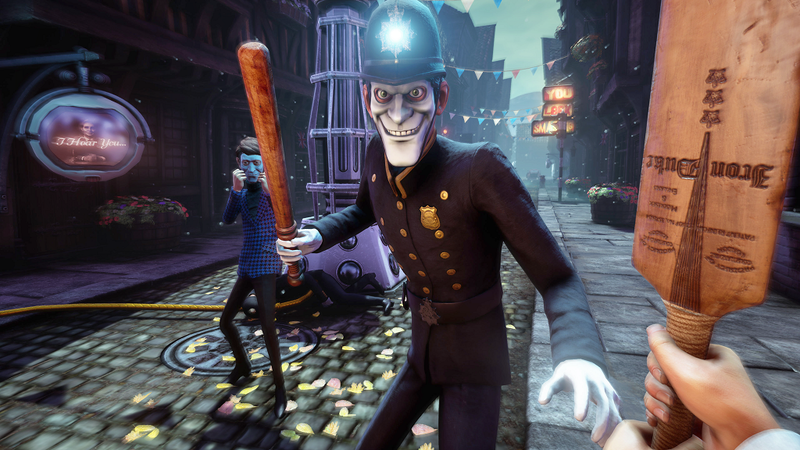 Are you planning on picking up We Happy Few when it launches?